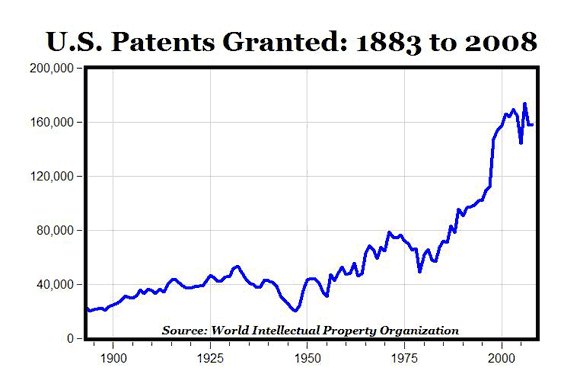 The chart above plots the annual number of approved patents in the U.S. from 1883 to 2008, according to data from the World Intellectual Property Organization. It’s interesting that it took more than 70 years for patents to double from 40,000 to 80,000 (1914 to 1987), and then only 14 years for patents to double again to 160,000 by 2001. In total, there have been 7,176,477 U.S. patents granted in the 126 years between 1883 and 2008. 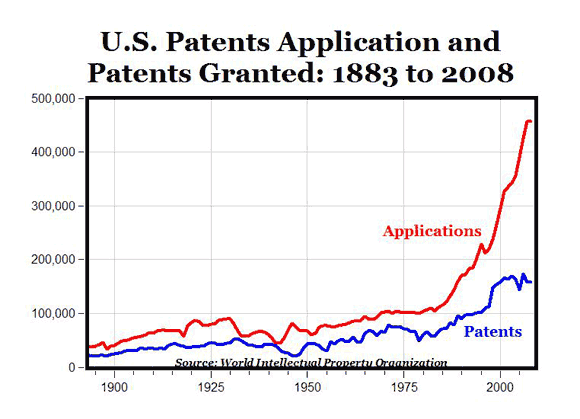 The chart below plots both the number of patent applications and patents granted, annually from 1883 to 2008, and shows the same pattern for patent application as for patents granted: almost a 70-year period for applications to double from 100,000 to 200,000, and then another doubling in only 12 years. 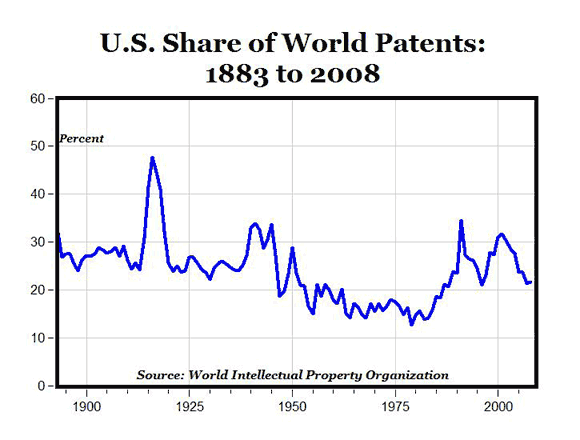 Finally, the chart below plots U.S. patents as a share of total world patents since 1883. In total, there have been 31,764,313 patents awarded worldwide from 1883 to 2008, and 22.6% of those (7,176,477) have been in the U.S. It looks like there was a spike during WWI and WWII for U.S. patents, and then a long period of below-average patent activity (relative to the rest of the world) in the 1950s, 1960s and 1970s, followed by an above-average period in the 1980s, 1990s and 2000s. Despite a declining share of world patents since 2000, the U.S. share in 2008 at 21.7% is close the average share over the last 125 years. The fact that Americans, with 5% of the world’s population, have received more than 22% of the world’s patents over the last century, is a testament to American ingenuity and innovation, our entrepreneurial spirit, and the dynamism of our (mostly) market economy.